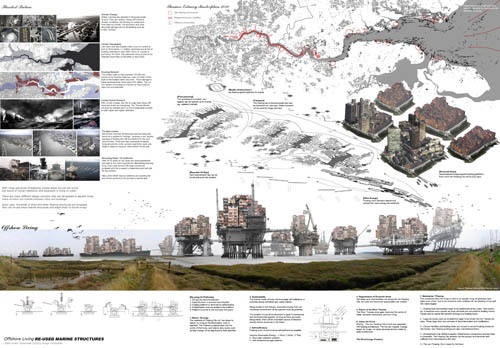 [Image: From "Floating City 2030: Thames Estuary Aquatic Urbanism" by Anthony Lau]. 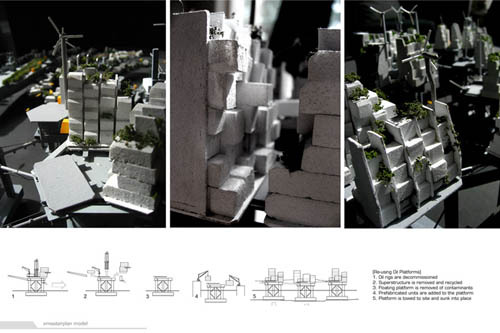 Continuing with a look at some noteworthy student projects—which kicked off this week with thesis work by Taylor Medlin—we now look at a proposal by Anthony Lau, submitted back in 2008 at the Bartlett School of Architecture in London. 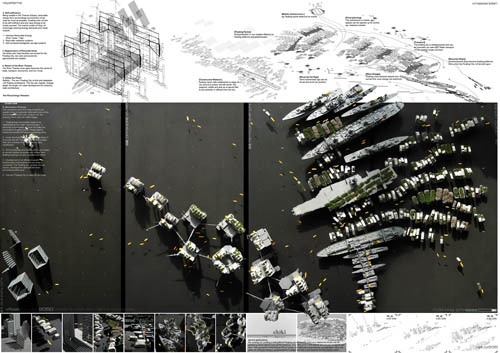 For that project, Lau designed a "floating city" for the Thames Estuary, ca. 2030 A.D. 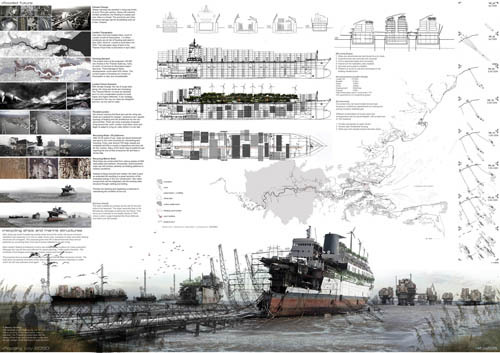 This "Thames Estuary Aquatic Urbanism," as Lau refers to it, "gives new life to decommissioned ships and oil platforms by converting them into hybrid homes adapted for aquatic living." While the idea of offshore architecture has been relatively depleted of its novelty over the last few years, the presentation and imaginative extent of Lau's idea is of sufficiently high quality to deserve wider exposure and a longer look. 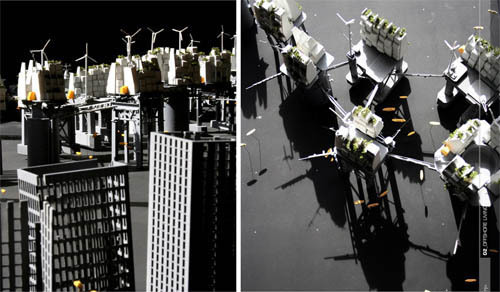 [Images: From "Floating City 2030" by Anthony Lau]. The multitude of hull shapes and sizes can inspire unique and inventive design. 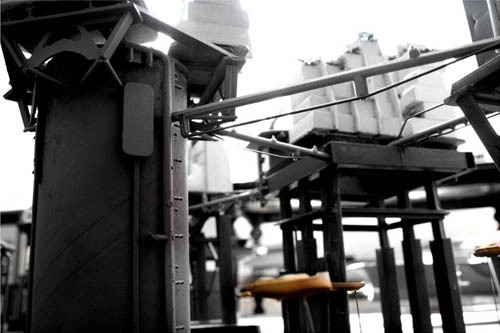 The proposal aims to express the beautiful forms and internal steel structures of hulls. The hulls serve as nautical reminders of the ship’s past and our previous closeness to water, which we will now embrace once again. 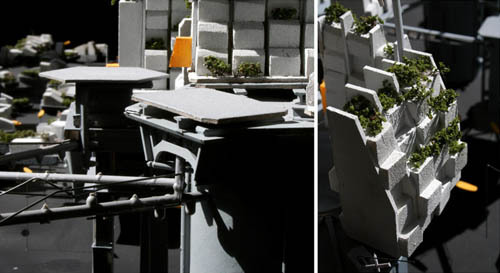 The level of detail in Lau's resulting models is astonishing; bridged superblocks of partially rebuilt oil platforms rise from the wetlands, amidst floating gardens and forest barges, like scenes from a maritime-industrial Avalon. You can see larger versions of these images (some of which have been cropped down and recombined to fit the vertical nature of this post, which means that you will see different groupings at this link) here. 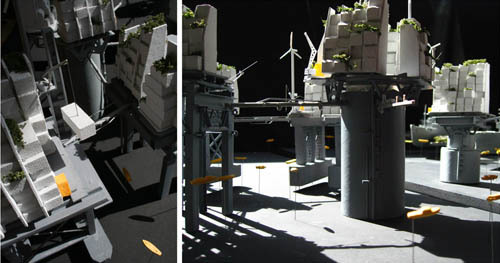 [Images: Models from "Floating City 2030" by Anthony Lau]. As Lau writes: "By utilising the flooded landscape, a floating city of offshore communities, mobile infrastructure and aquatic transport will allow the city to reconfigure through fluid urban planning. Wave, tidal and wind energy will be ideal for this offshore city and the inhabitants will live alongside the natural cycles of nature and the rhythms of the river and tides." He adds that "this strategy for creating a self sufficient floating city by reusing ships and marine structures can also be applied to island nations such as the Maldives. Over 80% of its 1,200 islands are around 1 m above sea level. With sea levels rising around 0.9 cm a year, the Maldives could become uninhabitable within 100 years. 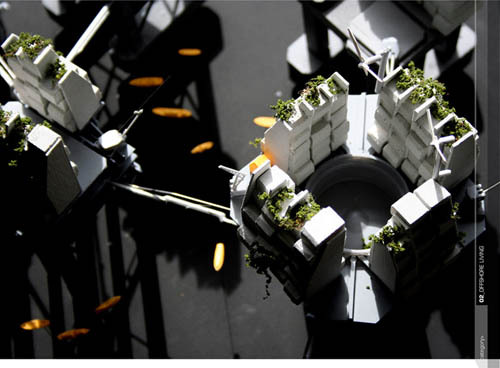 Its 360,000 citizens would be forced to adapt and they could become the first floating nation." [Image: From "Floating City 2030" by Anthony Lau]. 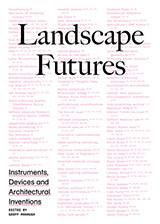 If Lau's work piques your interest, you might also want to take a look at a report released last year by the Institution of Civil Engineers and the Building Futures group, called "Facing Up To Rising Sea Levels: Retreat? Defend? Attack?" Looking to a 100 year horizon of climate change predictions, we will address how the urban, built environment needs to react now. Conservative estimates predict sea-levels to continue ro rise as the oceans warm and the ice caps melt. Coupled with isostatic rebound (the South sinking relative to the North) the effects grow ever more dramatic for large centers of population on the coast. Predicted weather patterns show increased rainfall intesity, leading to sever problems of surface water flooding in built up areas. The ensuing paper explores the architectural implications of three different hydrological strategies: retreating from the coast, defending what we've built there, and attacking the incoming waters with aggressive engineering. For substantially larger project images, click here. (Follow Lau's Cyclehoop project on Twitter: @cyclehoop). The City of Berkeley has been removing its old-fashioned meter boxes and installing ParkEZ Stations, but has left the meter poles. Cyclehoops would give new life to these poles. 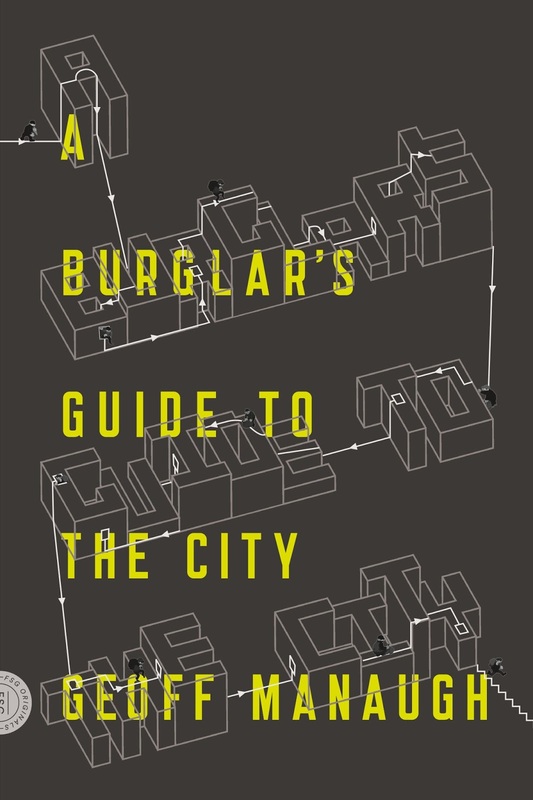 Great article on a hands on solution to a very, very possible scenario. . .I find it hard to believe that J.G. 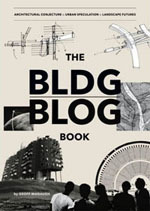 Ballard's classic The Drowned World wasn't even mentioned in passing. It happens in, yes, a flooded London. Hrm, nope, sorry, in a post-anthropogenic-climate-challenged world we'll have thousand better uses for iron shiphulls. Letting them rust away seems a huge waste. Somewhat related topic: the Soviets actually built a city on the Caspian Sea. The Caspian city of Oil Rocks was also on BLDGBLOG last summer. Feels a lot like Akira, I like it. Geoff, thanks for posting up my work! I hope you all enjoyed the images and model - this was created as part of my masters project at the Bartlett school of architecture. 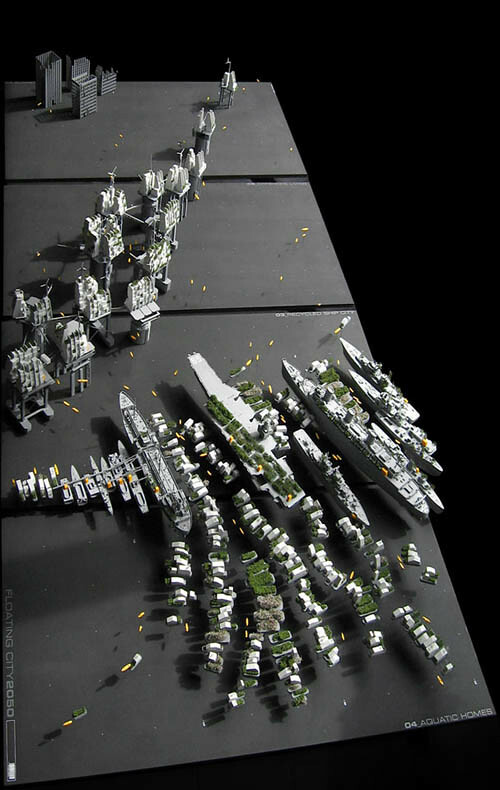 The majority of the model was made by cutting apart and reassembling old airfix model boats to create a floating city. My project was inspired by many things and I created a catalogue of images which I hope to upload at somepoint. This does include JG Ballards 'The Drowned World', films such as Ghost in a Shell, A.I. (the scene at the end), Waterworld and Howl's Moving Castle. I was also inspired by the old Thames Hulks (old gallions converted into jails), floating markets in vietnam, WWII Maunsell sea forts, mulberry harbour, the water buses system in venice, drawings of old battleships, google earth images of fish farms, ship moorings, and hundreds and hundreds of photos and drawings of ships of all shapes and sizes! Absolutely adore the aesthetics of the posters. Harmonious layout.